We’ve all been unsettled by chilling stories of the spirits who refuse to rest. We’ve read the tales, seen the movies, and occasionally we lean close to hear of someone’s personal experience with a ghost. Discover eerie legends and uncanny firsthand accounts of the ghostly and supernatural in a neighborhood perhaps just like yours, where residents of the quiet bedroom community of Webster Groves, Missouri come home nightly to unseen footsteps; resign themselves to objects mysteriously moving, disappearing, and reappearing; live with lurking, spectral figures; and otherwise share their homes with the ghostly and supernatural. Tag along with me wherever the adventure takes me. History, comic books, science, ghosts . . . you’ll be as surprised as I am some days. Patrick Dorsey has spent his career as a professional business writer helping people and businesses tell their stories. A natural storyteller his whole life, he began creating his own books in first grade by stapling together crayoned pages. 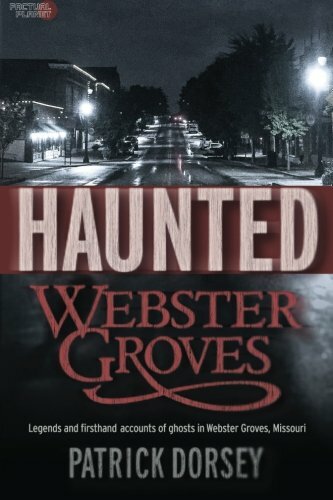 He’s authored fiction and non-fiction, from the Knights Templar thriller God’s Forge (his first novel published without either a stapler or crayons) to his collected firsthand accounts of neighborhood ghosts and hauntings, Haunted Webster Groves. As owner and principal consultant of Mightier Than The Sword Consulting, he produces materials for large and small companies across a range of diverse industries—creating successes that led to the publication of his winning approaches and methods in Write the Winning Proposal. He’s a St. Louis native in all but birthplace and holds a degree in English from the University of Missouri, St. Louis. It was in college he also began fencing, which he continues to pursue as an instructor and as president of the St. Louis Fencers Club. Want to keep in the loop on Patrick Dorsey’s latest projects? Sign up for the email list. You can also contact or follow Pat through Facebook, Twitter, and email.